The Brazilian UFO Disclosure is Going Better Than Expected. After two small and a medium size release of documents, respectively last year and last May 04, that I informed here before, we at the Brazilian Committee of UFO Researchers (CBU) -- which promoted the campaign that resulted in this opening of files -- have been officially informed that the government has now decided to disclose all documents produced in the 80s and kept secret so far. The release should be at the National Archives in 10 days. The Brazilian government has been gradually releasing a considerable amount of secret UFO documents, and doing so by decade. So far we have material from the 60s and 70s, most of these last ones released on May 04, specially 195 pages and about 180 photos of the Operation Saucer (including previous leakages we now have over 500 pages of a total presumed in 2,000 pages), conducted in the Amazon by the Brazilian Air Force from September to December 1977, that is certainly the biggest _known_ official innitiative to military investigate UFOs in the world. So far, over 1,400 pages of Brazilian previously classified UFO documents have been released thanks to the efforts of the Brazilian UFO Researchers Committee (CBU), through the campaign UFOs: Freedom of Information Now, started in 2004 and articulated by the Brazilian UFO Magazine. This last one has been the biggest disclosure ever in Brazil, but the one expected for August should be really big. 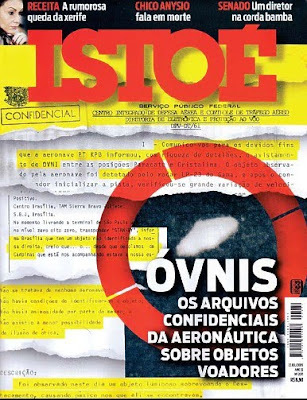 This last weekend the Brazilian UFO Disclosure finally reached the general public as the second largest circulation magazine in Brazil, ISTOÉ, published a nice cover and an article with 8 long pages dedicated to the opening of the files. No other general publication has devoted so much space to the subject so far. The reactions are considerable and the article is being republished in hundreds of local papers and websites, potentializing the response from the people. As for the documents already released, last month I have assembled a team of 30 volunteer translators to get at least the 500 pages already known (through the disclosures and previously leakages) in English to general knowledge. It should be ready in a couple of weeks to be published here and elsewhere. We expect to get the rest of the papers, of other military missions, very soon as well. It takes a lot of work. As said before, Brazilian UFO researchers are very excited about these new disclosures, that unquestionably prove that our efforts have been profitable for the entire Brazilian UFO Community. We also consider the Brazilian UFO Disclosure to be a solid, though painful response to the skepticism in Ufology in Brazil. * Many thanks to Marcos Malvezzi Leal for helping in the translation.